Hai Phong (VNA) – A scientific workshop on conserving biodiversity in Ha Long Bay and Cat Ba Archipelago was held in the northern port city of Hai Phong on August 24. 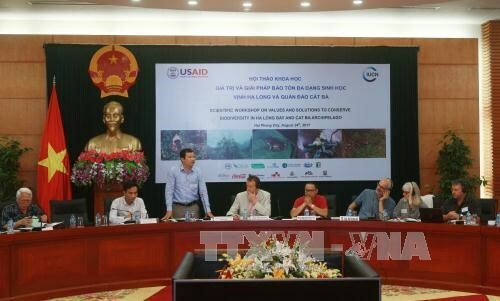 The event was organised by the International Union for Conservation of Nature (IUCN) as part of the Ha Long – Cat Ba Alliance initiative financed by the US Agency for International Development (USAID). The workshop created an opportunity for scientists to define the values of Ha Long Bay and Cat Ba Archipelago, update information on biodiversity and discuss measures to protect biological diversity. In June 2017, a group of scientists made a fact-finding tour to Cat Ba to evaluate its outstanding values, focusing on geological and biodiversity values. This is an important part in preparing dossiers to propose the expansion of Ha Long Bay, including Cat Ba Archipelago. Domestic scientists revealed research works on the biodiversity of underground caves and saltwater lakes, special features of Ha Long Bay and Cat Ba Archipelago. With financial support from USAID, the Ha Long – Cat Ba Alliance initiative was launched in 2014 aiming to build cooperation between local government, businesses and the community, through which promoting activities for environmental protection and conservation in Ha Long – Cat Ba. In 2015, the alliance formed a management board to engage enterprises in tackling environmental issues related to firms providing cruise services, while giving technical support to UNESCO in managing Ha Long Bay and proposing the expansion of the already recognised World Natural Heritage Site that includes Cat Ba archipelago. In the first phrase of the project, through USAID, the US Government supplied financial assistance for the IUCN and the Centre For Marinelife Conservation and Community Development. In the second phase, USAID will continue providing financial assistance to the IUCN to encourage the involvement of enterprises in preserving and protecting the site and assist the State in designing policies to promote such activities. It will also help Vietnam re-apply for Ha Long Bay’s World Natural Heritage Site for the third time, aiming to improve the management of the environment in the site. Located 45 kilometres east of Hai Phong, Cat Ba boasts a typical ecological system in Vietnam, including tropical rain forests on limestone islands, mangrove forests, coral reefs, sea grass, sand beaches and cave networks.